Thank you for letting me celebrate and prepare for your wedding. 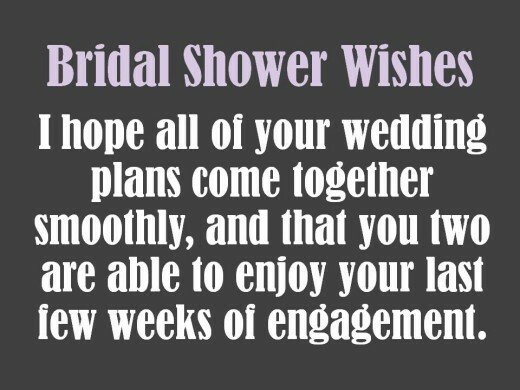 I hope your preparations go smoothly and that you two enjoy every minute of your wedding. 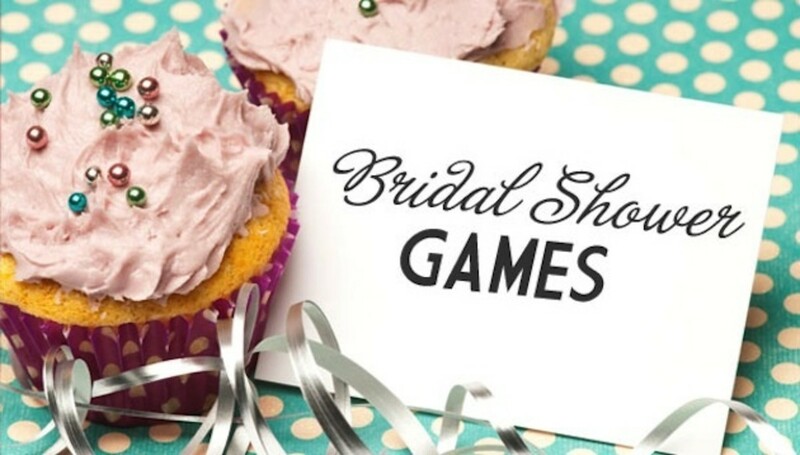 Wedding showers are a special time for the expected bride. She gets to have those who are most important to her surround her with blessings through supportive gestures. One of those supportive gestures is to encourage the bride in her new role as wife. Many options exist for the direction you can take. Use humor, quotes, verses, or even poetry. These will help you choose the direction you take with your message. I look forward to seeing you in your dress on the big day! We are super excited to celebrate your upcoming wedding, and we wish you the best! I hope your big day is full of magical, memorable, lovely moments. You will be an amazing spouse for an amazing person. I wish you both the best in your marriage. May your wedding be almost as beautiful as you! A beautiful wedding is just the beginning of a beautiful marriage! You two are going to be great together. I'm so excited for you! 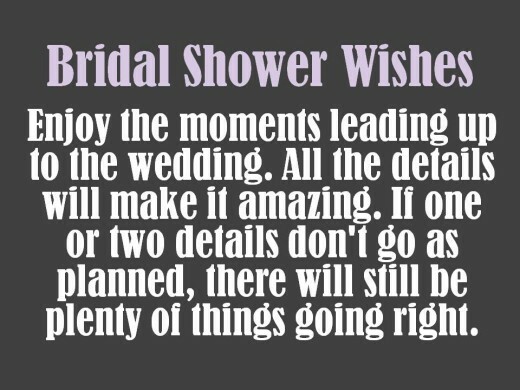 Enjoy the moments leading up to the wedding. All the details will make it amazing. If one or two details don't go as planned, there will still be plenty of things going right. I am happy for you, and I'm looking forward to the big day! I'm excited to be part of your wedding! It's going to be amazing! 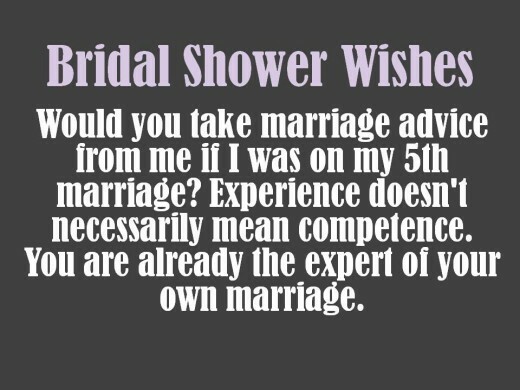 Would you take marriage advice from me if I was on my 5th marriage? Experience doesn't necessarily mean competence. You are already the expert of your own marriage. I hope all of your wedding plans come together smoothly, and that you two are able to enjoy your last few weeks of engagement. 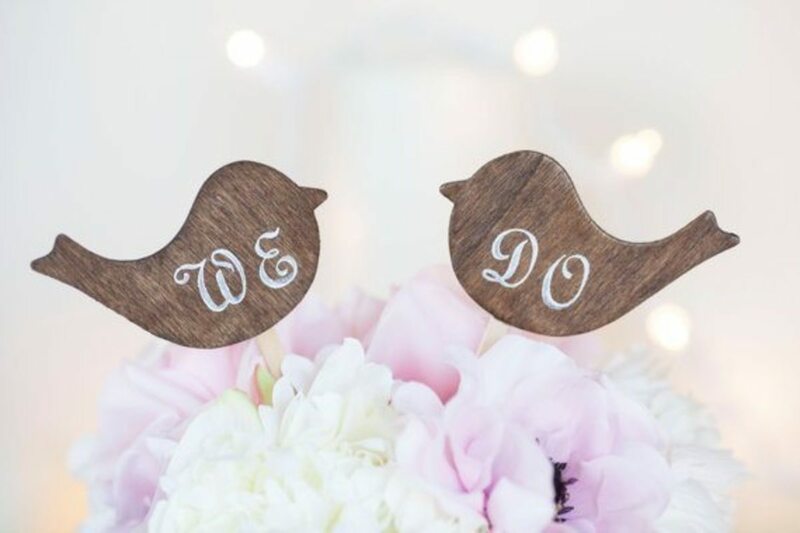 Planning a wedding is a lot of work, so remember to take some time to breathe and enjoy engagement. You have the rest of your lives to be married, but engagement is short. I'm excited to see such an awesome couple get married! Best wishes! May you and your husband be blessed in your marriage by the blending of your friends and family! Your commitment will finally become official on your big day. I'm wishing you the best! Marriage is a huge step to take, but you'll have someone to walk with you from then on. Watching you get married is going to be fun. I'm excited to see you walk down that isle. If you need anything or you just want to talk, please give me a call. I know wedding plans can become pretty stressful. Finding the person with whom you want to spend the rest of your life is an amazing blessing! 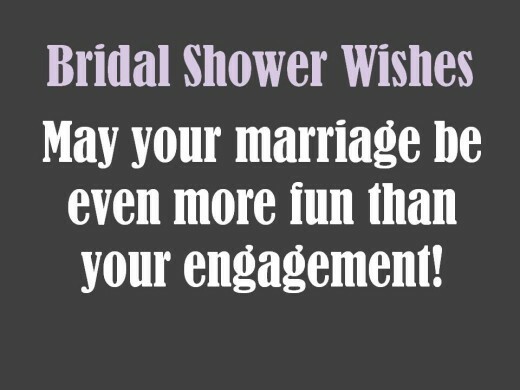 May your marriage be even more fun than your engagement! 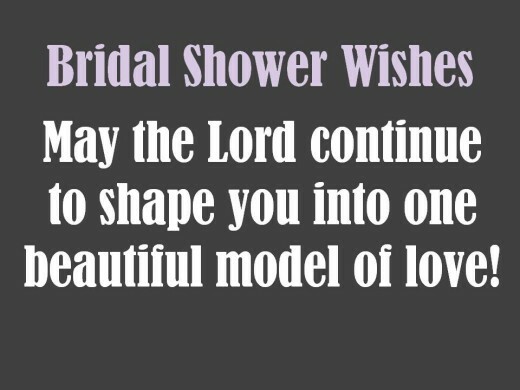 May the Lord continue to shape you into one beautiful model of love! 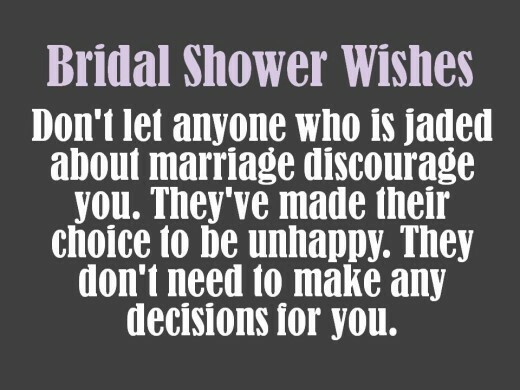 Don't let anyone who is jaded about marriage discourage you. They've made their choice to be unhappy. They don't need to make any decisions for you. Marriage is sacred. You will be blessed through each other. Let me know if I can help with any wedding preparations. I know that sometimes you might need someone to help who will listen to you and respect your wishes. Congratulations! It's a boy! And he's going to be your husband soon! Just keep reminding yourself, "It's just a wedding." Then when things don't go perfectly, you won't freak out. Oh, who am I kidding? You're one of the lucky ones who got a great guy. If you changer your mind before the wedding, send him my way. Just kidding! 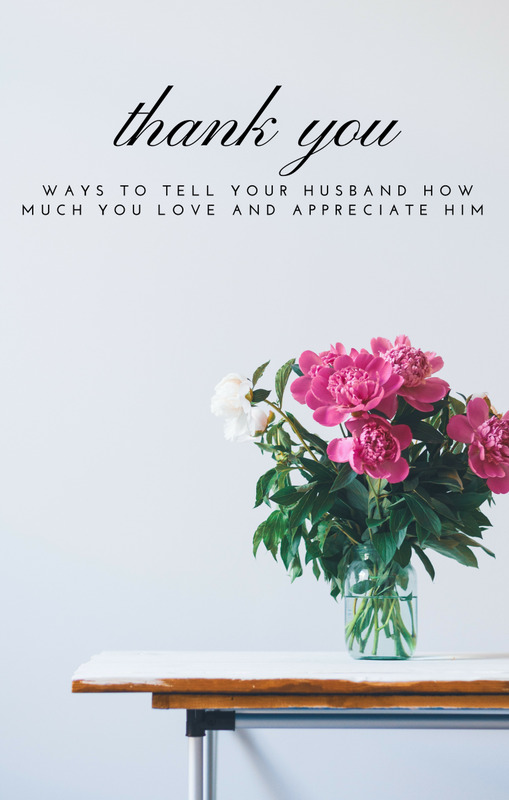 It's not that your husband will keep you from ever being unhappy. It's just that now you'll never have to be unhappy alone. The drama of planning a wedding serves as preparation for the struggles of marriage. Because of that, I'm not hoping for you all your plans to go smoothly. I hope it rains on your wedding day. Rain is good luck. If you didn't go through the stress of planning a wedding, then how could you be prepared for the challenges that marriage will bring? Some people get jealous of the bride, but I can honestly say I'm glad it's you getting married and not me. Bridal showers are good for letting you know how well the ladies of each family will get along. I'm glad that bridal showers are a tradition. 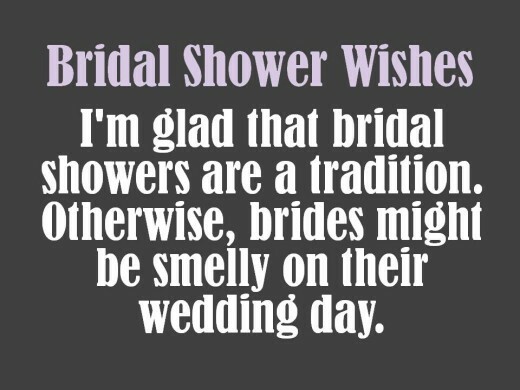 Otherwise, brides might be smelly on their wedding day. 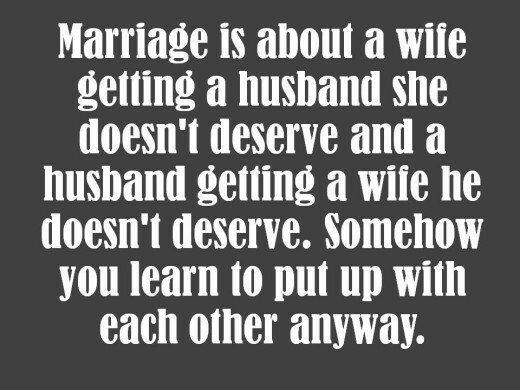 Marriage is about a wife getting a husband she doesn't deserve and a husband getting a wife he doesn't deserve. Somehow you learn to put up with each other anyway. I know you probably feel busy now. Soon, you'll have a husband. And it takes a lot of work to train a husband. So don't plan on not being busy any time soon. 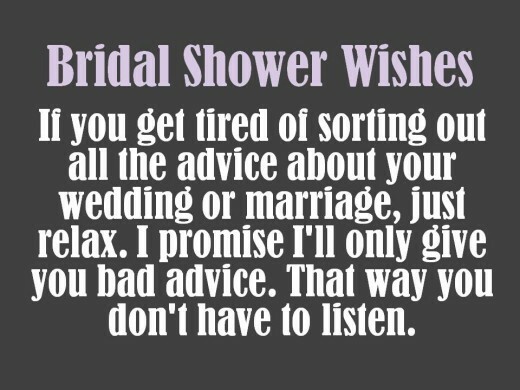 If you get tired of sorting out all the advice about your wedding or marriage, just relax. I promise I'll only give you bad advice. That way you don't have to listen. Doesn't it seem odd to you that our tradition is to spend a ton of money and stress out an engaged couple with a wedding? That way, you can be sure they will have a tough start to their marriage. There's something about me being around expecting brides that makes me want to complain about how stupid and horrible marriage is. Just kidding! Marriage is great. Isn't it sad when people do that? Just remember, if you get cold feet, it's never too late to get a divorce. That should be reassuring for you. 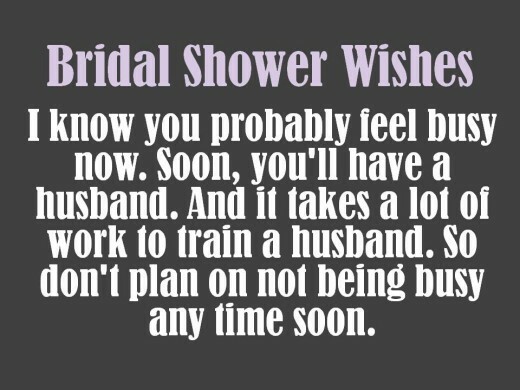 Future brides must be smelly or dirty because they need a lot of showers. 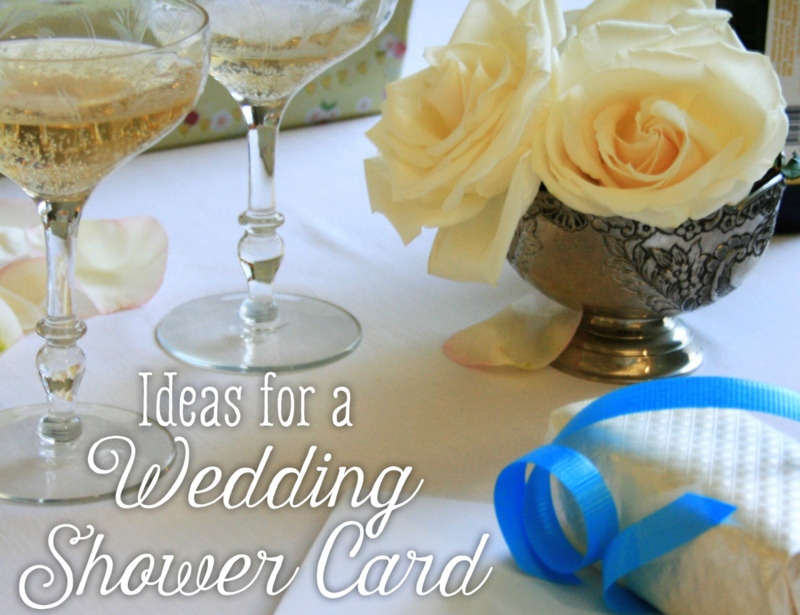 What is the best thing to give the bride at her bridal shower? Money. 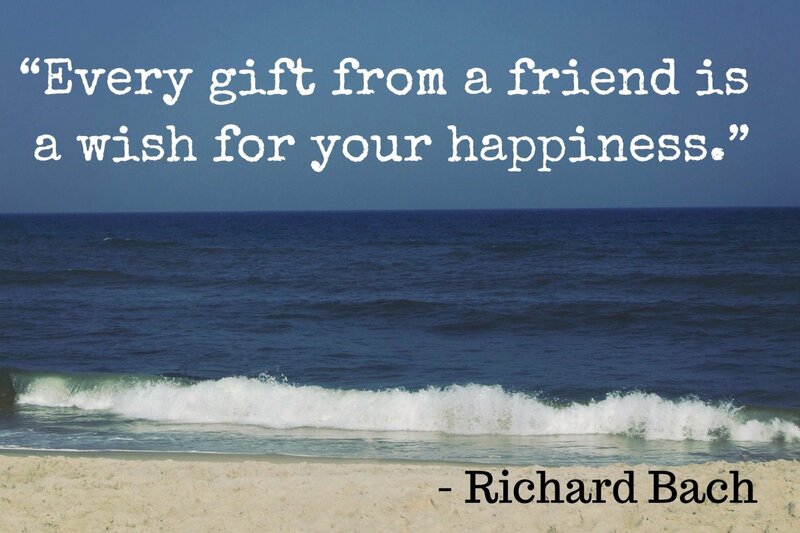 It's always the best gift. Something Useful, because it's the most helpful. Advice, because she's going to need it. Nothing. Why would you celebrate a marriage? Encouragement, because she needs it.